50% OFF ON EVERYTHING --MAKING HUGE BUNDLE DEALS--SELLING REMAINING CONTENTS AT 4:00 ON SUNDAY DEPENDING ON HOW MUCH MERCHANDISE WE HAVE LEFT! BRING BOXES---WE ARE ALL SUPER MOTIVATED TO SELL EVERYTHING!! 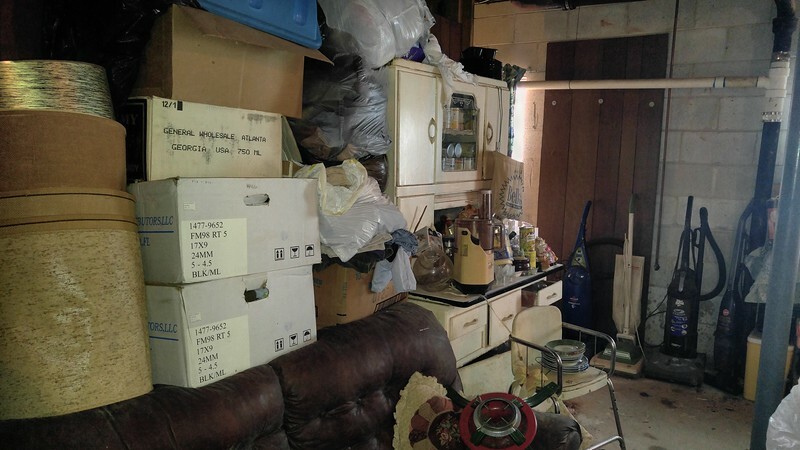 This 1950's home in Griffin Georgia is packed from top to bottom with collectibles. Big Mama was a major collector/hoarder of some really good items ( & multiples of many) She had a good eye that's for sure. In the pictures you will see many before & after photo's. Taken as we discovered/uncovered important items that we needed to feature. We realize this sale is the peaches to beaches weekend ..but it's time to have this sale & get this house cleared out! The lady of the house had great eye for collectible pyrex, collectible glassware & TONS of costume jewelry. All combined you have got one WHOPPER OF AN ESTATE SALE!! Below is a brief list of items available: this sale is in the category of hoarding/shopaholic. Just letting you know BEFORE time so you will not be shocked. I have learned in this business that there is good hoarding & bad hoarding...this is good! All you guys who love to plunder, have booths & shops will have to go through a couple of times to see everything! From chunky & flashy, to mid century modern, the collection is GOOD & vast! You will not be disappointed if vintage costume is your passion! We just discovered a wonderful fun collection of antique quilts in the attic in great condition --all old & hand sewn---one with sea turtles!! If you are a vintage Pyrex junkie....well you just might pass out! Step down into the basement bar area & you are on the set of the 60's /70's Show....from ashtrays, pictures, glassware, couches, coffee tables & more! sets of china, canister sets, platters, pitchers, plates, cups, glasses, MANY punch bowl sets ............most everything is collectible & can be put to good use. If you are into the catering ..don't miss this sale! You have landed in the land of trinkets & do dads! Especially angels & figurines! Big mama (not her real name) worked in a mill & you could open a store with the MASSIVE amount of towels & sheets!! Check back often for new pictures & video's posted in real time!! Skip peaches to beaches & come see me & the Kelly crew! !